These cute cupcakes are quick and easy to make for a baby shower, christening or other baby-themed event. You can make them as simple or as elaborate as you’d like. A whole plate of them looks really neat! What You Need: 1 cupcake; 1 mini cupcake; frosting tinted blue or pink or color of choice; white writing icing (premade in tube or use pastry bag and round tip such as #3). How to Make It: Frost regular-sized cupcake. Hold mini cupcake in your hand and frost as much of it as you can. Place it on the cupcake to form bootie leg. 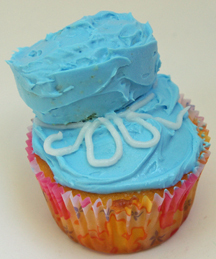 Use spatula to smooth out icing and secure mini cupcake to regular cupcake. Piping a bow helps conceal where the 2 cupcakes join. Squeeze evenly around bootie and into a bow shape. Feel free to get creative, adding stripes, flowers, etc. to your baby shower cupcakes!